Simran writes about her wedding story and bridal shopping experience for her three day celebrations in Grand Hyatt, Goa. Karan and I are both based in Lagos, Nigeria. Karan works in the family business and I have just completed a masters online from the University of Edinburgh. We both met in January 2011 on Republic Day. I was consulting for an NGO in Mumbai at the time and my friend (Karan’s brother) mentioned his brother was visiting the city on a work trip and he asked me if I could take him out for a drink which I gladly agreed to. I took him to ‘Dome’ at Intercontinental Hotel, Marine Drive. We said we’d meet for a 'drink', but it turned into two bottles of wine and dinner, and the evening only ended because the staff informed us they were closing. It was incredible to meet someone you could be silly with at one moment and switch to having an intellectual conversation at the very next. We met almost every evening that week and we decided to do long distance. A few months later, I moved back to London to work and we continued dating until he officially proposed. We got married in Goa on 14th July. None of our immediate families live in India, but we still decided to have a destination wedding here and not abroad, because we were sure it would be easier to co-ordinate a wedding here. We chose Grand Hyatt, Goa as both of us felt it is a stunning property. Its huge ballroom was another plus, their service is impeccable, and its architecture and design sets it apart from other properties in Goa. We planned a 3-day wedding extravaganza, which started with a welcome dinner on day 1, where our formal engagement ceremony took place. On day 2, we had the mehndi in the afternoon followed by the sangeet at night. On day 3, we had the ghari pooja in the morning, the baraat in the evening followed by the pheras and then the reception. My cousin (Rishika) and my aunt (Pooja) helped with designing all my bridal outfits. The best piece of advice I got before I started shopping was to start with the wedding ceremony outfit and then work your way out to the other functions especially when it came to selecting colours and styles. So I first shortlisted a Sabyasachi lehenga for the wedding ceremony. After that, I looked around for other outfits, but eventually realized that it is easier to design on one's own; you can pick the colours, embroidery and style, and you might have a stunning outfit for half the price of a designer outfit- of course this would mean more work, and you should consider this only if you have reliable people and talent to help- I was lucky to have my cousin and aunt patiently guide me through all this. And at every stage I kept logging on to Pinterest and WeddingSutra for references. On WeddingSutra website and their facebook page, I would look at photos to understand clothes colour combinations and décor ideas for our wedding festivities; watching wedding films and reading articles also helps but I think you can get the best feel and ideas through photographs. For my welcome dinner, I wore a yellow dress, which I ordered from a Spanish bridal store called Pronovias. I chose yellow because it is a fresh shade, and it felt like just the right colour for the start of the festivities. For the mehndi, I wore a turquoise ensemble with peach, which again were the perfect colours for a rainy afternoon and fresh mehndi. I teamed this outfit with a vintage Hyderabadi style polki set. For the sangeet, I chose a hot pink lehenga with an embroidered long net jacket, because I knew I would be comfortable in it and I had planned to dance a lot at this event. For jewellery, I wore a custom-made emerald and diamond set. My uncle and aunt who own Roopchand Jewels in Mumbai designed my entire jewellery collection. Karan bought his outfits from Just Men, Altamount road. The co-founder Dhanesh is very good at his work and designed smart outfits for Karan and his brothers. Sunita Divecha is very experienced (20+ years) and most importantly versatile. I think many brides nowadays opt for a trending or a big name artist, and assume that with a big name they are in good hands. While most of them may be talented, some of them I heard (through friends) have a bad attitude and that I feel can be a big disappointment for the bride. In all honesty, versatility, flexibility and modesty/humility were the three main qualities I wanted in a make-up artist. Versatility tells me the artist can give you any look in the world or create new looks if you want to be adventurous. 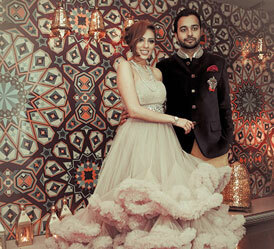 - For clothes, Sabyasachi’s store is a must-visit, but then again all brides know this. I love his ethnic wear, in terms of pricing I feel he is fairly reasonable so that is a huge plus. The cost of Indian wedding wear is very expensive these days, so ideally one must look for outfits that are lightweight and re-usable. 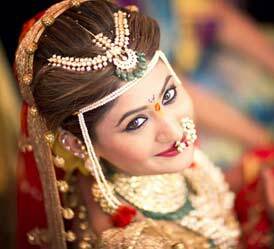 - Roopchand Jewels is a store I recommend for jewellery. It's an intimate place and you will be hand-held through your decision making process. When buying jewellery, you want to make sure you are in good hands and that you are ensured the best price and the best quality. - Crimzon Accessories (Opera House) Mumbai is a good place for shoes. You can even custom-make your shoes here, very useful when you want to decide on the height of your heels. - Choose your makeup artist wisely. At weddings there is a lot of stress, you will probably have a lot to deal with, and the last thing you may want to deal with is a tantrum-throwing makeup artist. It is YOUR big day and things may never go on according to the plan, so you'll need a makeup artist who is understanding and flexible. - You spend so much time deciding on your wedding outfits. Don’t forget to spend adequate time finding the photographer who will capture all your getting ready and precious bridal and wedding moments. Ankita Asthana and her team did a fantastic job with the photography.